Wicklow Archers began life as two separate clubs: Woodbrook Archery Club, which was formed in 2001 in St. Brendas college, Bray; and Garden County Archery Club, which was formed in Wicklow town in 2006. After a number of years Woodbrook outgrew the sports hall in St. Brendans and moved to shoot in the sports hall in St. Gerards in 2006. Woodbrook remained shooting outdoors in St. Brendans until 2009. When Garden County Archery Club formed, coaches from Woodbrook travelled down to Wicklow for 12 weeks, helping to run back-to-back beginners courses to get the club up and running. The two clubs have had a close working relationship ever since, along with a friendly rivalry. 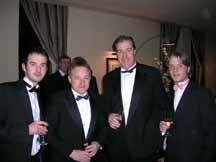 In February 2011 the two clubs decided to move to a shared venue to enable them to have a constant top class venue as well as enabling them to share the two clubs resources. In June of 2012 the committee decided to cement the partnership, the two clubs joined together under the name Wicklow Archers. The club has always enjoyed a high standard of junior archer and had representatives on the junior Irish archery team from 2001 to 2010. A high point of the junior success was in 2004, when Niall Doyle won the junior Euronations and subsequently won the Irish Junior Sportsperson of the Year award in 2005. In 2006 Harry Lyster became the first junior to win an Irish senior title when he became the senior Irish compound national champion. In 2006 Rohan O’Duill of Woodbrook made history when he became the first Irish person to compete in archery’s World Field Championships. In 2010 history was made again when 3 Woodbrook archers, Robert Hall, Niall Doyle and Rohan O’Duill, made up the first Irish team to ever compete at a World Field Archery Championships. Rohan and Niall also became the first brothers to represent Ireland together in international archery. Since 2007, first as Woodbrook, now as Wicklow Archers, we have run world class field archery events in Dargle Valley, Enniskerry. Each May we run the Irish Open Field Championships which is a world ranking event and each year attracts archers from Northern Ireland, England, Wales, Norway and Holland along with the top archers from Ireland. 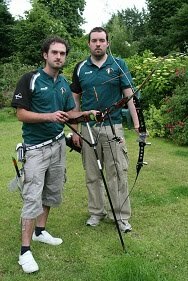 In 2011 the Irish Open was co-run by both Woodbrook and Garden County archery clubs. In 2015 in collaboration with Archery Ireland, Wicklow Archers hosted the World Field Championships Test Event in the Kilruddery House and Gardens in Bray. This was the first Archery competition of this level held in the country. The hugely successful competition saw archers arriving from all over the globe to compete in a Wicklow designed and run competition. Thanks to the excellent reputation of the Wicklow Archers and the well run test event, Archery Ireland succeeded in winning the bid for the 2016 World Field Championships which will again be held in the Kilruddery Estate. Two of the three courses will be designed by Wicklow Archers; Rohan O’Duill and Matthias John. In 2016 Eoin Wylie became the Outdoor National Champion in the Senior Male Recurve category, he also won the silver medal in the All Ireland Series 2016 in the same category. Roisin Mooney succeeded in winning the gold medal in the All Ireland Series 2016 in the Junior Ladies Recurve Category. Categories: Club Info, Competitions. Bookmark the permalink.